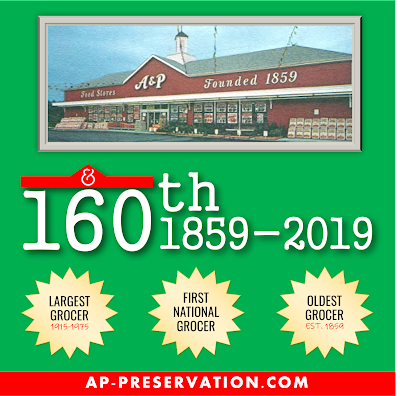 A&P is celebrating the BIG 160! A&P is celebrating the BIG 160 this year! We're celebrating with some interesting facts about A&P. A&P was the largest grocer in America from 1915-1975. Bruce Springsteen and Bon Jovi shopped at the Little Silver and Middletown A&P's. A&P was the first nation-wide grocer in America. A&P was the oldest grocer in America, being founded in 1859. A&P created the Woman's Day magazine. Dan Croce, Acme Markets president, was a bagger at the A&P. John Updike wrote a short story about the A&P. A&P was the world's largest retailer in 1930. Oprah worked at the Fort Lee A&P. A&P was renamed The Great Atlantic & Pacific Tea Company just after the Civil War, when the Confederacy was dissolved. In the 1880's, A&P opened a store every three weeks. Gallagher purchased watermelons at the Butler, NJ A&P. A&P opened its first Canadian store in 1927. John Travolta worked at an A&P in Englewood, New Jersey.